For the second year in a row, Dave has been invited to speak at Used Car Week in Phoenix, AZ as part of Repo-Con. This is one of the largest events in the automobile finance, repossession, and auto remarketing markets. 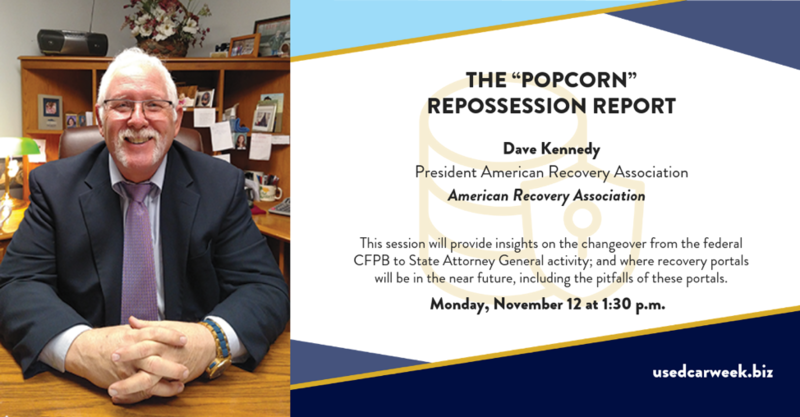 Sponsored by the National Automobile Finance Association and organized by the Cherokee Media Group, we are honored our President has been invited to speak once again and represent the repossession industry. With 15 years as a collection manager and senior lending officer in the retail banking field in conjunction with 28 years in the repossession industry, Dave is uniquely qualified to address both sides of the industry. In addition, Dave is a Certified Credit and Collection Compliance Officer (CCCO) and an FDCPA trainer specialist. He has helped several National Associations and private enterprises to develop training and compliance programs. His report on the trends in reported complaints, the new regulator, repossession portals, the face of repossessors today, and the future of the repossession industry will deliver keen insights for the collateral recovery industry and those interested in its future.